What do we know about the needs of children with Mosaic Down syndrome and their families? Mosaic Down syndrome is rare and families feel lost when they receive this diagnosis - often weeks or months after the child's birth. A new association (the International Mosaic Down Syndrome Association) will lead to progress. In October 2003, the first international conference on Mosaic Down Syndrome will be held in Florida, USA, following the recent establishment of an International Mosaic Down Syndrome Association. The establishment of the Association is an important step, for both parents and professionals, as we do not know enough about the effects of Mosaic Down syndrome. The IMDSA website (www.imdsa.com) has provided parents with a chance to share experiences with other parents and if many families worldwide join the Association it will be possible to begin to gain more detailed information on the needs of these children and their families. At present, it is difficult to find enough children in any locality to study their development. The reader is referred to the personal case histories of children on this site as they make clear the uncertainty that families feel when they receive the diagnosis and the very varied developmental profiles of children with Mosaic Down syndrome. It is estimated that 2 or 3 children in every 100 children diagnosed as having Down syndrome have the Mosaic form. Children with standard Down syndrome have an extra copy of chromosome 21 in every cell and this is the usual profile for some 96 in 100 children with the diagnosis. Children with Mosaic Down syndrome have some cell lines with the extra chromosome and some cell lines that are not affected and have the usual 46 chromosomes. A few children, 1 or 2 in a 100, have the translocation form of Down syndrome, when the extra chromosome 21 material is attached to another chromosome. Little is known about the development of children with Mosaic Down syndrome and how it may differ from the development of children with standard Down syndrome, which makes life very difficult for their parents. There are at least two published studies that suggest that, while they have a range of health and developmental difficulties which are similar to children with standard Down syndrome, these difficulties may be less severe. One American study of 30 children  and one Japanese study of 8 children  compared them with matched children with standard Down syndrome and their findings suggest that groups of children with Mosaic Down syndrome have a higher average IQ. However, group averages are not very helpful when the variability of children within the group is large. For example, the average IQ score for the Mosaic Down syndrome group may be 64  but some children may score 70 or more and some 40 or less. The average IQ for the standard Down syndrome group may be 52, but again some children will score 70 or more and some 40 or less. The range of scores for children with standard Down syndrome and those with Mosaic Down syndrome will, therefore overlap and some children with standard Down syndrome will score higher than some children with Mosaic Down syndrome, even if the averages indicate that the latter group may be less affected as a whole. This is illustrated in Figure 1. Figure 1. An illustration of the overlap of the IQ measures for children with Mosaic and standard Down syndrome. Children with either diagnosis may be represented in the shaded area. These studies are rather dated and I do not think that IQ measures have much practical value, but I am using them to illustrate the issues facing parents. An individual child with Mosaic Down syndrome may show less developmental delay than a child with standard Down syndrome or they may not. The findings of the first American study  and a more recent study of a larger group of 45 children carried out in the USA by researchers at the Medical College of Virginia, Virginia Commonwealth University,  can be found on the website of the International Mosaic Down Syndrome Association (www.imdsa.com). The researchers at Virginia have compared the children with Mosaic Down syndrome with their brothers and sisters and also with children with standard Down syndrome. The progress of the children with Mosaic Down syndrome was delayed compared to their brothers and sisters on all developmental milestones except age of first rolling over, confirming that the presence of Mosaic Down syndrome can be expected to delay development in all areas. When compared with children with standard Down syndrome, there was a tendency for the children with Mosaic Down syndrome to reach all developmental milestones earlier except in the area of speech and language development. This study, like the earlier ones, gives the picture of very similar health and developmental difficulties for children with Mosaic Down syndrome but possibly to a lesser degree. The families have made use of the same range of services including speech and language therapy, physiotherapy and occupational therapy. All but two of the children had received early intervention services and of the 30 of school age or older, all but one had benefited from additional support in schools. One child was fully included without support, ten children were fully included with support and most had experienced some inclusion. Are individual differences linked to cell pattern? Children with Mosaic Down syndrome can have different patterns of Mosaicism. In order to try to find out why some children are more significantly delayed than others, some researchers have tried to investigate links between the degree of disability and the percentage of trisomic cells (those with 3 copies of chromosome 21) that the child has. For example, some children have only 25% of their cells with the extra chromosome while some have 50% and some have 75% affected cells. It has been suggested that children with a lower percentage of trisomic cells, are less affected by developmental difficulties, but larger studies are needed to explore this issue, before we can be confident that there is such a relationship. We have had the experience of supporting a number of children with Mosaic Down syndrome in the past 20 years, and our evidence would support the view that these children have the same profile of speech, language, verbal short-term memory and learning difficulties but that their delays tend to be less than the children with standard Down syndrome. Some of the children with Mosaic Down syndrome that we know do not actually look as if they have Down syndrome - the usual physical features are not obvious. This raises some important and difficult social issues and identity issues for both parents and children, which parents have discussed with us. It is likely that no one would realise the child has Down syndrome unless told, even though the child's developmental delays may be apparent. How are these children going to feel about their identity as adults? Will they want friends to know that they have Down syndrome? Will they feel that they have much in common with other adults with standard Down syndrome? Does it help to tell teachers and other children that they have Down syndrome when they start school? Will they be treated in a more typical way if the diagnosis is not mentioned? One of the parents on the Association's website states that she decided not to tell others of the diagnosis. These are issues on which readers may have opinions that we would like to share as the implication is that society is still not fully accepting of individuals with Down syndrome and that most people would still rather not look different from the norm. Please write or e-mail if you have a view on this issue. If you are the parent of a child with Mosaic Down syndrome, do consider joining the Association. Details of how to join and of how to book for the conference can be found on their websites (www.mosaicdownsyndrome.com and www.imdsa.com). The conference is being held in Orlando, Florida so attending it could be combined with a visit to Disneyland! Dr. Colleen Jackson from the Virginia research group will be speaking, as well as Dr Len Leshin, Cindy Knapp (a parent) and others. One of us will also be contributing and we hope to learn a great deal from meeting many families and individuals with Mosaic Down syndrome. We will report on what we learn in a future issue. Fisher, K. & Koch, R. (1991). Mental development in Down syndrome mosaicism. American Journal of Mental Retardation, 96, 345-351. Ikeda, Y. (1973). Intellectual development of chromosomal mosaic children with Down syndrome. Japanese Journal of Special Education, 10, 44-59. Jackson-Cook, C. (1996). Mosaic Down Syndrome Research Study. Department of Human Genetics, Virginia Commonwealth University, P.O. Box 980033, Richmond, VA23298-0033. 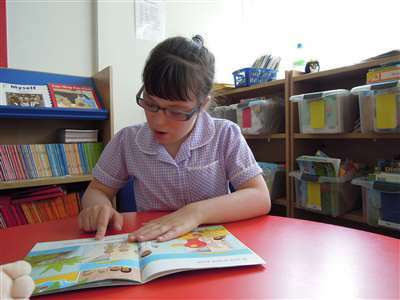 The Reading and Language Intervention for Children with Down Syndrome (RLI) offers educators a targeted, evidence-based approach to support the development of reading and language skills in children with Down syndrome aged from 5 years.